New Delhi: More than 80 years after the first flight took off from it, Delhi’s historic Safdarjung airport is going to be converted into a parking lot for the Commonwealth Games. The temporary park-and-ride facility at Safdarjung will have space for 3,000 cars, 6,000 two-wheelers and 450 buses, according to an official of the New Delhi Municipal Corporation, who did not want to be named. His indignation is echoed by many other people who have fond memories of the airport, and consider it the birthplace of aviation in India. When it started operations in 1929, Willingdon Airfield, as it was then known, was the second airport in the country and Delhi’s only airport. “When the airport was built, it was on the outer edge of Lutyens’ Delhi. The city as we see it today has come up around the airport," says Wasan. 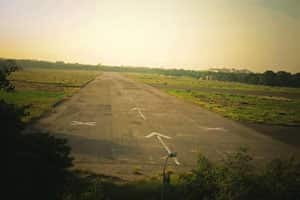 The airport was used regularly till 2001. Then in January 2002, fearing an 11 September style attack, the government put an end to most flying activities here. Since then, the airport has been used occasionally by the Airports Authority of India, helicopter company Pawan Hans, and for VIP flights. Click here to view a slideshow of images of Willingdon Airfield, as the Safdarjung airport was called historically. There was little evidence of even that occasional flight on the day I went to the airport. The bustle and noise of Delhi had miraculously faded away, giving way to a vast green open space surrounded by trees. The only sounds to be heard were bird calls and the rustling of leaves in the gentle breeze. From the second floor of the Delhi Flying Club building, on the edge of the airport, I could see right across the airstrip. The dome of Safdarjung’s tomb rose above the trees on one side, and those of distant Rashtrapati Bhavan on another. Apart from a few Air Force helicopters parked outside a hanger, the airport was deserted. The grass on either side of the runway had grown so tall that the breeze left waves in it. A.K. Gupta, secretary of the club, was smoking a cigarette in his office. “The Delhi Flying Club was created on 12 May 1928, and shifted here in 1929," he said, face creasing into a smile. “It was the best flying club in India, with some of the best aircraft of the times. We trained some of the first pilots in the country. The first five presidents of India were our patrons. We’ve still got the original certificates they gave the club," says Gupta. Being the only airport in the capital of British India, the Willingdon airfield saw lots of activity. It was where the Imperial Airways flights from Egypt to Delhi and onwards to the Far East landed. In the 1940s it was used by the British Indian Air Force for training. It also saw some famous last flights—Lord and Lady Mountbatten took their final flight out from here, as did Mohammed Ali Jinnah. During the Partition, the airfield was used to evacuate refugees, and in 1948, to airlift troops to Srinagar. In the years following Independence, the airport was home to Indian Airlines. “As a child, I remember Indian Airlines’ Dakotas operating from the airport," says Gupta. “At that time, there was no flyover, just a level crossing. Often the planes would fly so low that cyclists had to duck." Wasan also has fond memories of those years. “The Gliding Club of India started at the airport in 1950. I joined it as an instructor in 1954," he reminisces. “At that time there was very little air traffic. We used to go up in the morning to around 10,000ft, fly the whole day, and come down in the afternoon. The Flying Club was also very active in those years." According to him, Jawaharlal Nehru would attend the annual celebrations of the club every year. “I’ve seen him fly, but I never got the privilege of taking him up," he says. “After his death, every Children’s Day, we’d invite school children to the club and take them on joyrides over the city." The airport has also had its share of notoriety. In 1962, Daniel Walcott, a swashbuckling Texan who’d won a contract from Air India to carry freight from Afghanistan to India was caught smuggling ammunition in his DC-4s. He was freed after some time in jail, but one of his planes at the Safdarjung airport was impounded. However, he was given access to the airport to pour a little fuel into his plane and run the engines. He managed to do that often enough to accumulate enough fuel for an escape. And escape he did, despite five airport guards hanging onto the tail of the plane. He headed to Pakistan, but not before, as legend has it, circling over Tihar jail to drop a packet of cookies for his fellow inmates. After Indian Airlines shifted out to Palam airport in 1962, Safdarjung was used largely for recreational flying. Both Rajiv and Sanjay Gandhi learnt to fly here. In 1984, the Ballooning Club of India brought hot-air ballooning to India through the first balloon mela, which was held at the airport. Balloonists from around the world participated in the mela, which went on to become a colourful and much-loved Delhi fixture. The airport’s last big moment came in 1988 when aviator industrialist Vijaypat Singhania’s ultra-light plane landed at the airport after a record-breaking flight from the UK. The debate on what to do with the airport has been on since 2004. A whole range of proposals have been put forward but nothing seems to have happened. “It should be preserved as an aviation museum," says Alpana Kishore of New Delhi People’s Action. “It’s such an iconic presence for Delhi that even Tintin, in Tintin in Tibet, is shown flying out of Safdarjung airport. It’s part of our modern heritage. If for some reason that can’t be done, it should be preserved as a green area, something we desperately need in this city," says Kishore. K.T. Ravindran, chairman of the Delhi Urban Arts Commission, also thinks that “as a long-term plan, the airport should be left as an open, green space". Aviation experts such as H.S. Khola, former chief of the Directorate General of Civil Aviation, would like the airport to be retained for aviation use. “It’s one of the few city airports in the world. As the city grows there should be some entry point for small aircraft into town." Wasan believes that the airport should be used for emergency services. Then he adds wishfully, “We’re hoping that one day they will let us fly our gliders at the airport once again. It really is the best place to fly." But Gupta seems to have given up hope. “We’ve still got two Cessna 152s parked in the hangar," he says, looking pensively across the airfield. “I’ve been meaning to fly them out for good…just as well, now that the airport is going to be converted into a parking lot. Creating a parking lot, even if it’s a temporary one, will damage the tarmac completely." Security officials have told him he can use a one-hour window when the Prime Minister is not in town to fly out his aircraft. “I will fly the first to Karnal in the next few days. And when the other one is repaired, I will fly it out, too."